the Ardent Designs Glass Tree line has 2 sizes, make sure the design you chose is the size you want. These pretty tree earrings are made of very subtle bluish/green glass with a soft gold luster lik.. 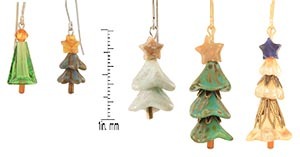 These pretty tree earrings are made of deep earthy green, blue and brown colored glass. The stars.. These elegant tree earrings are made of silver pewter. The stars in this unique jewelry are carve.. These pretty tree earrings are made of evergreen-colored glass with lovely goldtone highlights. T.. These pretty tree earrings feature trees of stones with little glass trunks. The stars in this un.. These pretty tree earrings are made of earthy glass with a soft gold luster. The stars in this un.. These pretty tree earrings are made of your choice of glass with Autumn Jasper stone stars. A.. These pretty tree earrings are made of your choice of glass and plated pewter with a variety of s.. These pretty tree earrings are made of olive-colored glass with lovely gold luster highlights. Th.. These pretty tree earrings are made of evergreen-colored glass with lovely silver luster highligh.. These elegant tree earrings are made of silver or gold plated brass The stars in this unique jewe..
Swarovski Crystal Christmas Tree .. These pretty tree earrings are made of amber-colored glass with earthy warm iridescent highlights.. These pretty tree earrings are made of earthy glass with soft colors of sage green and ivory. The..